In an environment where the job pressures are high and couples lead an erratic and unhealthy life style, Dr BALDEV CHADDHA, a well qualified fertility expert, runs a fertility clinic and a SPERM BANK in Dariyaganj, New Delhi, that guarantees a high quality and specialized sperm for the purpose. Unfortunately he has more failed cases to his credit than successes. A healthy, high performing donor is the need of the hour. VICKY ARORA, a young, good-looking, PUNJABI guy from Lajpat Nagar, is the only son and of no financial support to DOLLY, a widow, who runs a small beauty parlor from home. As luck would have it, a small brawl in the colony brings DR CHADDHA and VICKY, face to face, where CHADDHA, concludes that Vicky could be THAT donor he has been looking for. From here on, CHADDHA'S days and nights are spent in convincing Vicky to become a donor till he finally gives in. Vicky finds his love interest in ASHIMA ROY, a pretty BENGALI girl, who works in a Bank. 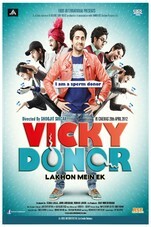 But soon there hunky dory world comes crashing down because of Vicky's past as a donor. With a brief emotional roller coaster ride, VICKY DONOR is a light-hearted take on the subject of sperm donation. A youth-centric movie with a humorous theme, VICKY DONOR is fundamentally a romantic comedy between a Punjabi boy and a Bengali girl set against the backdrop of sperm donation. Nonetheless, director Shoojit Sircar takes a light-hearted, optimistic look at the issue, coming up with a film that entertains and enlightens the viewer vis-à-vis infertility and artificial insemination. VICKY DONOR may be a diminutive film in terms of budget and costing, but when you see the issue it tackles, it does not give the impression of being an undersized film. On the whole, VICKY DONOR is a small film with a big heart. The makers have had the courage to bring a diverse issue out in the open, narrating a daringly different story without getting preachy. Witty, funny and also emotional, VICKY DONOR is forward-thinking, progressive commercial cinema which vastly enlightens and hugely entertains! Director Shoojit Sircar is back with a bold, first-of-its-kind concept that's taboo. He makes this sperm of an idea swim all the way. He intelligently uses comedy to break mindsets, without embarrassing moments or awkward lines. The film entertains, without preaching sexual moralities or social service. Even the music blends beautifully with the story. The winner here is the script (Juhi Chaturvedi), penned with subtlety, oodles of non-slapstick humour, while sensitizing the cause at hand. However, the lingo gets too Punju at times and the last twenty minutes could do with some editing. It takes a man to make a film like this, literally. Kudos to John Abraham for his brave maiden production. Thankfully, this sperm hits bullseye. Vicky Donor makes every minute count.In between all this there's a whole lot of fun for the audience, thanks to Juhi Chaturvedi's impeccably funny screenplay, that includes witty yet conversational dialogues and typical 'dilli' mannerisms that are smartly woven to guarantee a paisa vasool entertainment. How can anything go wrong with such enlightening story-telling backed by perfect casting? Nothing does. Vicky Donor takes the closet issue, turns it on its head and spins a light-hearted tale around it, one that fertilises genuine fun at the movies. With a brief emotional roller coaster ride, Vicky Donor deals with a sensitive issue of sperm donation, in quite a light-heart manner. The Punjabi tadka and Delhi culture adds sparkle to an interesting subject. It definitely not just targets youth, but also assures entertainment aesthetically. The first half tickles your funny bone, while the second seems to be dull in partsNo big star cast which will attract audiences to the theatre. However, natural and brilliant performances will surely speed up the word-of-mouth publicity process for the flick. It's definitely a must watch if you genuinely crave for different, entertaining and paisa-vasool cinema.